Our company specialises in a variety of areas, but our main focus has always been the manufacture and installation of traditional wooden sash windows. Our portfolio is filled with a great number of successful projects that implement high-quality solutions, perfectly exemplifying the excellence and reliability of our detail-oriented manufacture process. At your disposal is an attentive, qualified team of employees who devote themselves completely to evert task at hand. We take an individual approach towards every project and make an honest effort to meet your needs with the services we provide. 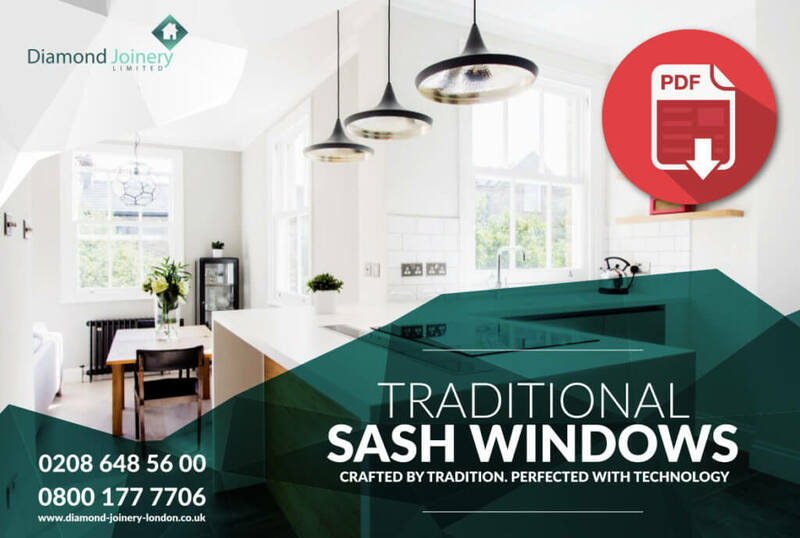 Take a look at the variety of sash windows we have on offer and you are bound to find one that fits your property and expectations the best.Whether you’re looking for a traditional sash window, box sash, slim box, or hidden spring window, we have everything you need. The elegance and practicality of wooden sash windows, combined with their distinct vertical sliding system, is a perfectly fit for any home. Our best-selling hardwood products are a unique blend of a truly authentic style and preciseengineering. Designed and manufactured by Diamond Joinery, they are always a perfect match for your home, serving as a perfect compliment to your home’s decor regardless of style. If you are thinking of improving the comfort of your home we can provide you with a variety of modern and technologically advanced solutions that can make your original wooden sash windows become much more practical and durable. Made using a fine selection of genuine hardwood, they look truly superb, and the special locking systems provide you with a high level of security and peace of mind. Additionally, we offer double or triple-glazing services, as well as professional draught-proofing. As a result of an established partnership with a number of respected companies, we offer finishing touches to our products using high-class ironmongery, making them a perfect addition to your elegant London home. A staple of London homes, sash windows are one of the most popular types of window in London, providing you with classic looks and modern technology, giving you the best of both worlds. Also known as the double hung sliding sash windows, box sash windows are an alternate take on the classic sash window. Enjoy the classic beauty with a modern twist! A perfect way to bring out the natural beauty of your country home, casement windows are the ultimate rustic accessory that will help make your home feel warm and cosy. Carrying all the benefits of casement windows but not made of wood, this modern alternative to the timeless classic will satisfy anyone looking for a solid window. An impressive addition to any Victorian home, bay windows allow for more light to enter your home, visually enlarging it at the same time. Protect your home from the elements in an even more reliable way with our incredible stormproof windows. BESPOKE YOUR HOME WITH US! © 2016 Diamond Constructions. Design, development & SEO in Google by Neadoo Digital. All rights reserved.